One of the more interesting and attractive developments in recent years has been the modification and improvement of a popular variety known as the Kujaku (“peacock” in Japanese) The first Kujaku was created in 1960 by crossing a matsuba ogon and a hariwaki. The result was a metallic koi with reticulated scales and a pattern of yellow, orange, or various shades of red on a white background. The Kujaku became an instant hit with collectors. For show purposes, Kujaku is placed in the Hikarimoyo class, competing against other patterned metallics including hariwaki, kikusui, yamatonishiki (metallic sanke), and metallic bekko. Due to the added refinement of the reticulated scales, the Kujaku has a definite advantage over the other members of this class, and is most often selected as “best in class” for hikarimoyo. Occasionally a Kujaku would be seen with a deep rich red pattern, but it was a rarity as the hariwaki lineage most often results in yellow to orange shades. Recognizing a demand for the red (beni) Kujaku, breeders embarked on the goal of developing a Kujaku with consistently red coloration. A breeder in Niigata, Japan, by the name of Koneko, became the first to achieve this. He reputedly crossed a traditional Kujaku with either a metallic Kohaku or a red Kikusui, and the result has been a new line of beni Kujaku which have become the standard of the breed. 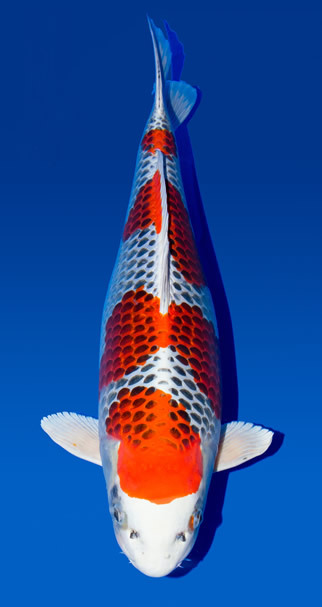 When selecting a young Kujaku for your collection, look for a koi with excellent metallic sheen. Also, check for even, sharp reticulation on all scales. On a tosai (one-year-old koi) this reticulation may not be “up”, so if you are not sure of the breeder it may be best to purchase Kujaku at two years old, when the reticulation is more likely to be developed. The head should be clean and white with no smudging or black markings, and the fins should be a lustrous silvery color. As always, look for a healthy koi that appears to be curious and actively swimming with its tank mates. The pattern on a Kujaku should resemble that of a Kohaku. In other words, pleasing to the eye and balanced from head to tail and side to side. A simple two or three-step pattern seems to work very well with the reticulation. A busy pattern can look too chaotic when coupled with the reticulation. It can be a challenge finding the “right” Kujaku for your tastes, but when you finally find that elusive red Kujaku, you should consider adding it to your collection.